coolant based on Organic Acid Technology (OAT). Extreme Green Radiator Coolant is a long life coolant based on Organic Acid Technology (OAT). This organic acid technology coolant provides a number of advantages over traditionally used cooling system corrosion inhibitor formulations. Various blends of organic acids have been found to provide excellent protection to those metals making up the cooling system, and are less readily depleted from the coolant solution than older style inorganic inhibitors such as commonly used silicates, phosphates and borates. These ‘older style’ coolants can precipitate from the coolants during use, particularly if incorrect levels or proportions are present, or if hard water is used. This often leads to inadequate protection against corrosion (particularly of aluminium alloy), reduced heat transfer, radiator core blockages and abrasion of water pump seals. Other traditional inhibitors include amines and nitrates, which cannot only be detrimental to the protection of aluminium alloys, but may also lead to the formation of carcinogenic nitrosamines. Automotive: current ratings up to 240,000 km. Diesel: current ratings up to almost 1,000,000 km. Extreme Green Radiator Coolant is very economical in use. Buffered to pH 7.5 to 8. Superior high temperature corrosion protection. Universal coolant suitable for automotive and diesel applications. Extreme Green Radiator Coolant is a long life hybrid organic acid coolant that does not require SCA (supplemental coolant additive) addition prior to 480,000 km or 6000 hrs. Extreme Green Radiator Coolant is biodegradable. However, during the circulation of product through engine system, hard metals may be picked up and disposal as per local regulations is recommended. 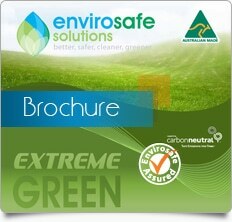 Extreme Green Radiator Coolant is compatible with all commercially available SCA’s. Extreme Green Radiator Coolant is packaged ready-to-use. No dilution is required. A refractometer may be used to measure the level of ethylene glycol. Envirosafe can supply customers with a refractometer upon request.